Published: Feb. 14, 2018 at 09:26 a.m. Updated: Feb. 14, 2018 at 04:25 p.m.
You either have a franchise passer -- or you don't. That's life in today's NFL, meaning the offseason to-do list is far more pressure-packed for teams still questing for a quarterback. Land one -- like the Niners did with Jimmy Garoppolo -- and the complexion of your entire roster begins to shift. You can magnify Nick Foles as the counter argument, but he looms as an outlier. His journey from Eagles backup to Super Bowl MVP resonates because it's vastly unusual. It's startling that our planet fails to produce 32 fully functional starting quarterbacks at once, but that's the reality every autumn as a handful of clubs consistently whiff on the most important position in sports. Who else were you expecting? No other franchise has more to prove after completing a winless season (and notching just one victory over two grisly campaigns). Ex-football czar Sashi Brown was conveniently scapegoated for the team's epic troubles, but he left the franchise in plum position to make a tangible leap this offseason. The path ahead is promising for new general manager John Dorsey, who inherited a king's ransom of draft picks and the league's deepest treasure trove of cap room. Barring a successful run at free-agent-to-be Kirk Cousins, the Browns are a lock to take a quarterback with the first or fourth overall pick in the 2018 NFL Draft. Beyond that, Dorsey must turn Sashi's massive draft haul -- with six selections in the first 65 picks -- into a bushel of future stars. Anything less will be viewed as one of the more gaping lost opportunities of the century. Had the Browns successfully dealt for Garoppolo, we'd see this team in a vastly different light. The reality, though, is that Hue Jackson didn't get enough from his players -- especially at quarterback. Beyond that radioactive void, the Browns could also use a game-changer in the secondary, a reliable wideout and another option at running back. With Dorsey set to add a wave of talent -- and, hopefully, the best quarterback available -- Jackson will have no excuses come September. Gang Green just squeezed a brilliant campaign out of old-as-the-trees QB Josh McCown. The Jets, though, resemble the Browns in their ongoing search for a franchise arm. Outside of Brett Favre's juicy run in 2008, New York has been forced to counter the division-rival Patriots with a cascade of journeymen and noodle arms throwing anti-darts to a largely forgettable cast of skill-position players. It's time to swing for the fences. Any lingering in-house hope in Bryce Petty or Christian Hackenberg must be comprehensively eradicated. General manager Mike Maccagnan is under pressure after picking both of those players, but he deserves credit for creating mounds of cap room with last year's veteran purge. 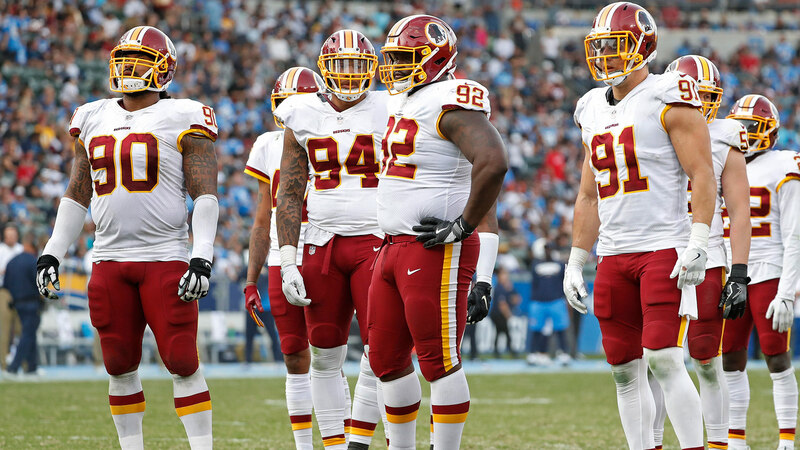 Assuming they part ways with runner Matt Forte and defensive lineman Muhammad Wilkerson, the Jets will boast north of $85 million in space -- enough to make a legitimate run at Cousins. New York could also use an edge rusher and new blood in the secondary. Reportedly in talks to re-sign cornerback Morris Claiborne, the Jets are bound to look for a cover man to pair with him. Malcolm Butler, Davon House or Trumaine Johnson would make plenty of sense. Free agency doesn't offer much depth along the offensive line, leaving New York as a candidate to draft multiple blockers. Chalk it up as a make-or-break winter-into-spring for Maccagnan. Look for the Bears to generate plenty of hype this offseason. For good reason, too, with John Fox having been swept aside in favor of first-year head coach Matt Nagy. A favorite of Andy Reid, Nagy shined as a play-caller in Kansas City and now must flip the switch on a Mitchell Trubisky-led offense that was hard to watch in 2017. The Bears must surround Trubisky with weapons the way Philly did with Carson Wentz one offseason ago. While Cameron Meredith is a developing wideout with promise, Kevin White (21 catches for 193 yards and zero touchdowns in five games played since being drafted seventh overall in 2015) remains a raging question mark. Consider Chicago a candidate to raid the open market for pass-catchers -- Paul Richardson would give Trubisky a tantalizing deep threat -- and even use the eighth overall pick on a true No. 1 wideout. Nagy's scheme requires versatile tight ends, something the Bears currently lack, outside of monstrous Adam Shaheen making the leap. Jordan Howard and Tarik Cohen form a dangerous backfield duo, but Nagy's work has just begun. He comes from a Chiefs franchise that evolved on offense by acquiring top-end athletes -- with a premium on speed -- and using them in a scheme doused in college and pro concepts. With former Oregon coach Mark Helfrich on hand as coordinator, the days of Chicago putting fans to sleep on offense should be a wrap. Finding the right pieces -- in a hurry -- is the trick. A legitimate Super Bowl contender with talent on both sides of the ball, Minnesota has fewer conventional team-building chores to accomplish than the rest of the organizations on this list. The Vikings are in a unique position, though, with all three of their quarterbacks -- Case Keenum, Teddy Bridgewater and Sam Bradford -- set to hit free agency. Which way to turn? Keenum dazzled behind an average-at-best offensive line, playing consistently stellar football (3,547 yards, 22 TDs, seven picks and a 98.3 passer rating in 15 games) from wire to wire and jacking up his asking price in the process. Still, this is the same coach and front office that traded up to acquire Bridgewater, who doesn't turn 26 until November. Bradford feels like the odd man out, leaving Minnesota to decide between making a play for Keenum, keeping Teddy or swinging for the fences with Cousins (unless Bridgewater's contract is tolled.) Whoever winds up starting could use added help up front at the guard position, with veteran Joe Berger expected to retire. Unlike Dorsey in Cleveland, Broncos GM John Elway can't simply blame his predecessor for the team's roster issues. It was Elway who drafted Trevor Siemian and traded up to pick Paxton Lynch. Both quarterbacks flatlined in 2017, leaving the Broncos in a messy position heading into the offseason. Yet another candidate to chase after Cousins, Elway must find a secure answer at the position or risk wasting his talented defense for another season. Imagine a Broncos team that lands Cousins, uses the fifth overall pick on running back Saquon Barkley and taps into the draft to rebuild an offensive line that could use help at left guard and a steady presence at right tackle across from second-year bookend Garett Bolles. Head coach Vance Joseph would also benefit from some fresh talent at receiver and support on defense at the inside linebacker position. Elway masterfully lured Peyton Manning to town in 2012, but his recent drafts include a rash of curious picks -- and a potential bust at quarterback in Lynch. Plenty of other general managers wouldn't survive the wreckage, but Elway has a chance to rewrite history if he can land Cousins. Look for Denver to go all out. Packers are in a pickle while San Francisco deals with safety strains. Take a look at some of the biggest weaknesses teams must address this offseason.